This is definitely at the top of my list. Yesterday, we had an uncharacteristically beautiful winter’s day. We’re not just talking sunshine. We’re talking 24 degrees (Celsius), no cold bite to the breeze and summer vibes. Blue skies. A buzz in the air, like it was making everyone collectively happy. Oh, I wish I could have bottled it. If every day of the year was like yesterday, I would be a very happy person. It was the perfect interruption to the winter blues for me, personally, and just the boost I needed. Apparently, we’ve been forecast for showers for the rest of the week, but I shall remember yesterday and hold it close to my heart for the rest of the winter! We did some gardening and we even got to eat a light, nibbly dinner al fresco! I had chilled out Triple J tunes cranking into the backyard all afternoon (at a respectful volume of course) and we could hear the neighbours’ kids playing too. It really was a taste of summer. Sometimes I just need to exercise the non mum part of my brain. This past week I got a lot done at work and it made me feel really good, like I’ve still got it. Our household had a week and a half of illness free bliss. I am hoping to continue this, but realistically, I am sure this isn’t the last we’ve seen of the winter bugs. It was wonderful. The Little Mister made it to day care every single day (he goes twice a week), which meant I was able to put in some good hours at work and run around alone getting things done. That hasn’t happened in ages! It was a blissfully average week. It was also a relief that when the weekend’s original social plans were sadly cancelled, it wasn’t us who had to pull the plug for once (we hope our friends feel better soon)! The Little Mister goes to swimming lessons each week and while it can seem quite tedious for us parents, we always make sure we’re there (provided the Little Mister isn’t sick). He’s a little uncoordinated at times (poor kid gets it from me), but he plugs away at it and when we see some progress, we feel so excited and happy for him. The past couple of weeks we saw such a leap in his confidence. He was able to float on his back unassisted for a little while (something he’d been scared of before – hated having his ears in the water) and then this week, he took a leap and was able to ‘swim’ to his teacher a couple of metres away. It was sort of a half submerged torpedo attempt, but he didn’t sink and he tried really really hard. I’ve never been prouder. He is going up to the next level this coming week! The staff at the swimming centre were so supportive and made a big fuss of him – so cute. There’s nothing like seeing your child feeling really proud of themselves when they’ve worked hard for something. He was on a high all evening – even called all his grandparents to share the news. Nawwww. It’s only a short stay before she has to head back to the US (where she lives with her lovely husband) for a few months, but knowing she’s on home soil is just wonderful. We’re going to catch up soon – I’ve missed her SO much! You know the mates who you see after a huge break, but it doesn’t matter that you were apart, because you can just pick up where you left off? She’s one of those precious gems. We’ve been making our home soil catch ups a priority since forever – I’ll always have time for her. So much love! Mr Unprepared securing a great temporary promotion. It is kind of an extended hiatus from his current position, which will give him so much great experience. He had to apply and interview for it, so I’m proud of him for giving it a go and being successful! Brooklyn Nine Nine on Netflix (don’t judge me). Finishing Orange is the New Black. Buying a dress in a size 10 (I’m usually a 12 these days). Sure, the sizing at that particular store can be a tad generous, but it was still a win because there have been tough times where even fitting into a size 12 (and still feeling good about it) has been stressful. I might be struggling at a weight plateau right now, but to see where I’ve toned up is just so encouraging and motivating. Must keep going and push harder with my exercise (and better eating – the tough part). I borrowed my mum’s document shredder so I could get rid of old letters and bills (and anything with our private details printed on it) that we are no longer required to keep. The sound it makes as it eats all those annoying pieces of paper that have been cluttering up our home is just music to my ears! I could shred documents all day! In all seriousness, it’s great because I think those pieces of paper were just kept around because it was too time consuming to destroy our identifying information by hand. With this great decluttering tool, I have been motivated to do so much more to work towards my dream of a lady blogging cave. 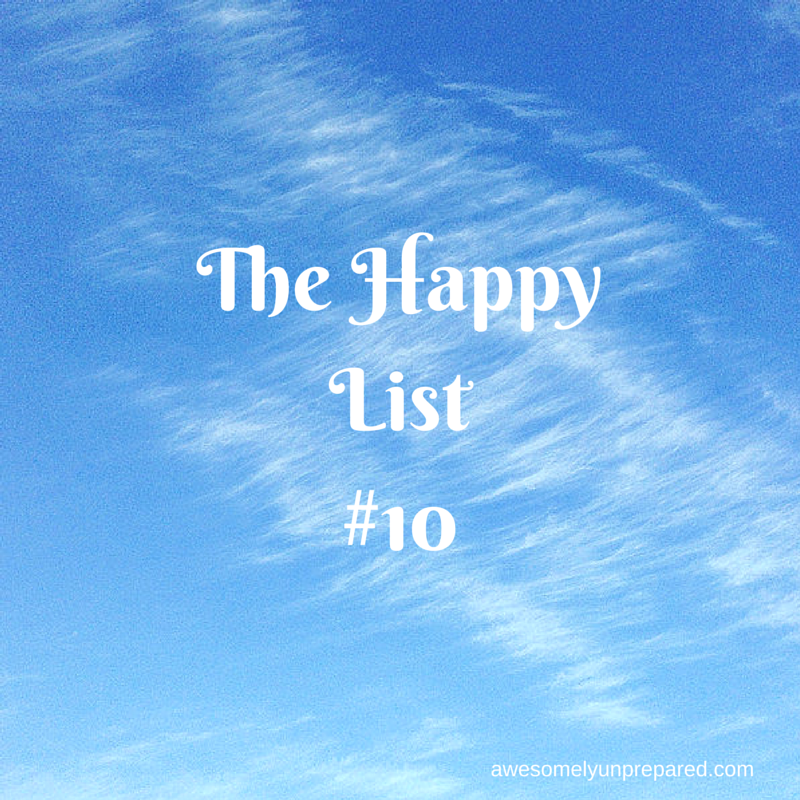 What would you put on your happy list this week? How to survive those last few days before pay day. Everyone’s a critic: If my home received a TripAdvisor* review.